In October 2019 Warsaw will once again host most prominent heads of states, military representatives and experts in the fields of foreign policy, security and defence. This year the Warsaw Security Forum (WSF) will be held on 2 - 3 October, for the 6th consecutive year. Warsaw Security Forum is organised by the Casimir Pulaski Foundation. In October 2019 Warsaw will once again host most prominent heads of states, military representatives and experts in the fields of foreign policy, security and defence. This year the Warsaw Security Forum (WSF) will be held on 2 – 3 October, for the 6th consecutive year. Warsaw Security Forum is organised by the Casimir Pulaski Foundation. The upcoming edition of WSF just like in previous years will focus on fundamental challenges to be addressed by NATO, the European Union and Eastern Partnership as well as both organiations’ member states. The scope of topics will encompass international relations and cooperation between states as well as security issues putting pressure on security in cyber, energy and economical spheres. Not less important will be subjects related to women’s involvement in shaping political decisions, terrorism, Russian Federation’s revisionist policies, One Belt One Road initiative, disinformation actions (so-called Fake News) and strict military aspects such as strengthening the alliance’s Eastern flank or the future of air and missile defense in Europe. WSF is mainly directed to governmental decision makers and representatives of EU and NATO member states and experts. Previous editions of the forum were attended by i.a. President of Georgia Giorgi Margvelashvili, President of Estonia (2006–2016) Toomas Hendrik Ilves, Prime Minister of Poland Mateusz Morawiecki, Deputy Prime Minister of Ukraine Ivanna Klympush-Tsintsadze, Head of the National Security Bureau of Poland Paweł Soloch, minister of Foreign Affairs of Lithuania Linas Linkevicius, Deputy Minister of Defence of Hungary Tamas Vargha, NATO Supreme Allied Commander Europe Gen. Philip Breedlove and Deputy Secretary General of NATO (2012 – 2016) Alexander Vershbow. 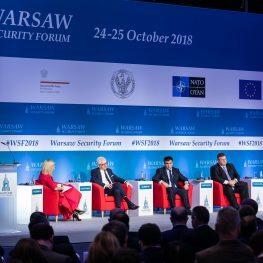 Warsaw Security Forum is a platform dedicated to high governmental and military representatives and experts facilitating exchange of experience and debate on crucial, current and future, security and political issues. WSF aims at working out a collective response to challenges and threats faced by NATO and EU and deepening cooperation in the defence sphere. From the beginning, since 2014, the National Security Bureau of Poland is the Strategic Partner of the forum. Warsaw Security Forum is organised by the Casimir Pulaski Foundation.